Tis herself Irish gift is a Celtic pill box that features a knot-work motif. This 'tis herself Irish gift is also ideal for himself too. This decorated Irish pill box features a Celtic knot design on the faux ivory hinged lid. 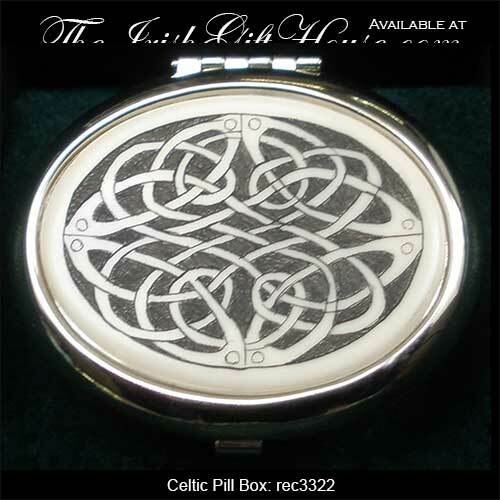 The silver plated over brass Celtic pill box measures 1 3/4" oval x 1/2" tall and it is gift boxed with a Celtic knot history card, complements of The Irish Gift House. Tis herself Irish gift is a Claddagh pill box that is enhanced with a Celtic knot motif.